When I was in my 20’s I could eat anything I wanted and still look and feel great. Now in my mid 40’s I know I can look at feel like I am in my 20’s if I follow a healthy lifestyle or exercise and proper nutrition. 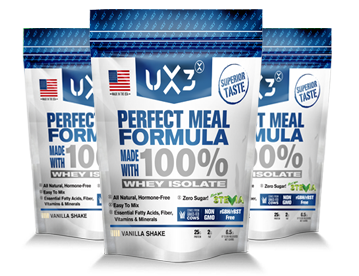 UX3 is one of my top lifestyle secret weapons. As a fitness industry insider, I’m always looking for products that produce outstanding results. 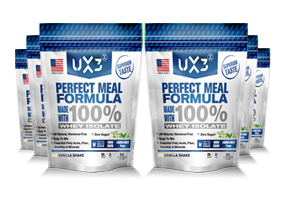 UX3 stands above the crowd because the ingredients are of the highest quality, the macro-nutrient breakdown is perfect for people who want to lose weight and build lean muscle and it tastes great and mixes easily ever in water. If you’re like me and want the highest quality protein, vitamins, miners, EFA’s and fiber all in one body shaping formula… Look No Further! UX3 is what you need!!! Having been around fitness and supplements for 3 decades I can honestly say that I’v seen and tried nearly everything under the sun, and I can honestly say that UX3 is an excellent source of protein. It’s manufactured to the highest of standards, they didn’t skip a beat with ingredients that work and I know the guy who made this and his integrity is unparalleled, so with all that said I can honestly say this is a great product. As a mother of 3 with a full time job and a competitive athlete, proper nutrition is always a challenge. Most supplements I’ve tried bloat me and don’t give me the energy I need to keep up with my day. UX3 has been a life saver. It tastes delicious, it digests so well, I never get bloated and it gives me the energy I need to be energized at work, power through my workouts and still have energy to keep up with my kids! I used to think I had to starve myself and do endless cardio in order to lose weight. Once I realized I needed to eat and exercise wisely the weight came off and stayed off. 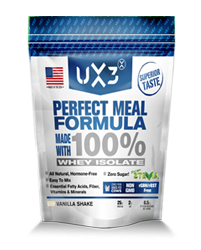 UX3 feeds my body what it craves in just seconds and helps me lean, energetic and healthy, while keeping my sweet tooth satisfied. I was lifting weights most days, working, trying to eat right and live a normal life and it was overwhelming. All I did was replace two of my “junk” meals with UX3 and a piece of fruit, cut back on my workouts and then I lost the weight and started to feel more in charge of my life. I found out that being healthy and fit could be simple and tasty. The key to success isn’t your ability, intelligence or skill. There are many very gifted failures out there. Life’s rewards come from what we do, not from what we have and most people simply don’t have the energy to get to the next rung in their life and to do what is necessary to succeed. Success requires energy. Period! Everyone was created to operate at peak performance, yet lifestyle choices may stop you dead in your tracks! You can live an energetic, passion filled life! Your dreams can become reality starting today! In Climb YOUR Ladder of Success Without Running Out of Gas!, John M. Rowley will give you common sense, easy-to-implement steps that will significantly improve your energy, passion, body and life. NOW and FOREVER! DARE TO LIVE THE LIFE OF YOUR DREAMS! The Power of Positive Fitness is a ”whole person” fitness plan that will quickly give you the energy you need to live an inspired life. The self help, fitness, and spiritual communities have tended to segment a person’s life into isolated parts. Not this book. This book is passionate about seeing every dimension of your life developed to its fullest–being physically, mentally, and spiritually fit and living a lifestyle that supports your life. John Rowley, author, speaker, television and radio personality, and Wellness Director for the International Sports Science Association, will help bring your physical, mental, and spiritual goals to reality as you follow a plan you will find doable and enjoyable.